METHOD OF PAYMENT: Students may pay with cash, cashier's check, money order, MasterCard, VISA, Discover or American Express. AAA Construction School, Inc. does not accept company or personal checks. AAA Construction School, Inc. is dedicated to making sure you get your Florida State Certified contractors license. AAA Construction School, Inc. contractors' exam preparation classes focus on the exam questions and construction exams answers you need to pass the first time. You will get your Florida contractor's license by highlighting the contractor exam questions in your books prior to taking the construction exam. AAA Construction School, Inc. prepares you with practice construction exams including construction math questions and answers. All construction math solutions are displayed in an easy to read format. Florida construction exams are known as being the most difficult construction exams in the nation. 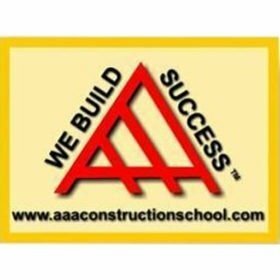 AAA Construction School, Inc. has assisted thousands of Florida contractors over the last 4 decades to successfully pass the Florida construction exams. AAA Construction School, Inc. has live construction exam preparation as well as home study construction exam preparation. Once enrolled you may purchase CD's which review all construction exam books allowing you to highlight the construction exam answers before you take the construction exam. If construction math is a problem you can purchase color-coded construction math DVD's enabling you to quickly pass the Florida construction exams. Florida construction licensure is easy with AAA Construction School, Inc. Knowing the Florida construction exam answers before taking the Florida construction exam is a sure fire way to gain the Florida construction license you want.